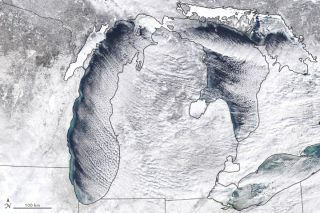 A NASA satellite called Terra captured this image of Michigan and the Great Lakes on Jan. 27 as temperatures plummeted. It's winter in the United States, and swaths of the country are currently experiencing bitter cold brought on by a phenomenon nicknamed the polar vortex, a pattern weather satellites are watching closely. The National Weather Service is offering a blunt message about the cold weather, calling it "life-threatening." The cold temperatures are caused by Arctic air masses drifting farther south than usual, bringing biting winds that are pushing wind-chill temperatures in regions of a dozen states as low as minus 40 degrees Fahrenheit (minus 40 degrees Celsius). That's cold enough to cause frostbite in half an hour. "One of the coldest arctic air-mass intrusions in recent memory is surging south into the Upper Midwest before spreading across much of the eastern two-thirds of the country," a statement posted to the National Weather Service web page reads. "Through late week, expect frigid temperatures, bitterly cold and life-threatening wind chills, likely leading to widespread record lows and low maximum temperatures from the Upper Midwest to the Great Lakes and Ohio Valley." If you live in regions affected by the bitter cold, avoid going outside, bundle up in layers if you have to go outdoors and keep an eye on your local weather forecast.